Damon Hill, the talented gentleman, was leading the race ahead of Alain Prost. I was aware that he was leading his home Grand Prix and looked set to win his first race. Soon after I started watching, Hill’s engine blew up and his race had ended. I remember feeling quite sorry for him and at that moment, I became a Hill fan. I had no idea how often the races were held and, without the wonder of the internet, had no idea when the next race would be on TV. Formula 1 racing was not as popular as it is today with coverage the way it is and adverts on nearly all the time. Purely out of good fortune, I managed to find out when the German Grand Prix at Hockenheim was showing. I can’t remember how exactly I found out but I was happy I was catching the race from the start this time. On the first lap, I remember seeing a driver in a red and white car spinning around at the first chicane. The car stopped pointing the wrong way. He had to wait until all the other drivers had passed before being able to rejoin and I remember thinking how his race must have been ruined. After all the cars had passed, he spun the car back round again to face the right way in a very small amount of space. The commentator (the legendary Murray Walker) mentioned how it requires a great deal of skill to be able to perform such a manoeuvre. It was Ayrton Senna. Looking back on it, I don’t think Senna had performed a manoeuvre that the other drivers would not have been able to do. It may be that Murray Walker was talking about how F1 drivers are in general skilful drivers. But this first impression imprinted Senna in my mind. As the race went on, Damon Hill led and looked set to win his first race after the disappointment of the British Grand Prix. But on the penultimate lap, his left rear tyre blew out and he lost the race to his teammate Alain Prost yet again. Senna had fought his way from dead last back up to fourth. As the season went on, I missed most of the races due to not knowing when they were on TV. I heard that Hill had finally won his first Grand Prix at the next race in Hungary and I was pleased about that. Some time around the end of 1993, I rented a copy of Ayrton Senna’s Super Monaco GP II for the Sega Mega Drive from our local video and game rental store. The game was incredible! You could race in a full championship season starting your career in one of the lower teams – Serga (one letter away from being Sega). In the game, you could either challenge a rival or be challenged by any of the other drivers in an attempt to move from your current team and get a drive with another team – or if you weren’t careful, move down a team or two! Each of the other drivers in the game were fictional characters who had some characteristic similar to one from the actual Formula 1 drivers driving cars with names which closely resembled the names of actual Formula 1 teams. This was probably due to licensing issues. The one exception to this was Senna himself of course. He drove for the team with the fastest car in the game (the Madonna instead of McLaren) and was the man to beat. To say that I played this game a lot would be the understatement of the century! I eventually bought it of course and there was one session where I played for approximately 14 hours straight! I wouldn’t recommend anyone playing any game (or really doing anything) for that long! You can see the ending in the video below (it’s not me playing). 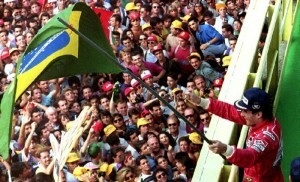 By the time the 1994 season came around, I had learned a lot more about who Senna was and had become a firm Senna fan. Through a combination of playing Senna Super Monaco (the short title for the game), reading about Senna in the Radio Times (one of the TV listings magazines) and hearing a little about Senna from David, I couldn’t wait for the 1994 season to start and see Senna win what would be his fourth world drivers championship. So there I was on the 1st of May in my living room in Ireland eating chocolate covered wafers and drinking orange squash. Senna was on pole position again despite the car being difficult to drive and was poised to take his first victory of the 1994 season and get his championship campaign back on track. He had suffered problems in the first two races in Brazil and Japan. Senna had not scored any points and Michael Schumacher had gotten 20 points under his belt. As the race started, Senna was out in the lead and it was looking good. On lap 7, as his blue Williams-Renault went around the first corner, something happened and he exited the circuit hitting the wall at high speed. “NO!! !” my friend and I yelled at the screen. I had not really seen any big accidents in Formula 1 up till now but I had an understanding that the cars were very strong and that it was likely he would be alright. After a short amount of time, the medical cars arrived and it was clear that the accident was a little more serious than I had first thought. I had not seen the qualifying sessions for the weekend and was unaware that Roland Ratzenberger, a driver in his first year in Formula 1, had tragically lost his life during the second qualifying session of the weekend the day before. Death in Formula 1 was not something I was aware of. As I found out later, the last time a driver had died during a Grand Prix weekend was 1982 when Gilles Villeneuve crashed during qualifying for the Belgian Grand Prix. Elio de Angelis lost his life during testing in 1986. It seems silly now but I just had no idea of the potential of death in Grand Prix racing. As we watched the helicopter take Senna away to hospital, we just assumed that he would be alright. We watched the rest of the San Marino Grand Prix which was decided on aggregate timing. At one point, my friend commented on how he had lost interest since Senna wasn’t in the race. I agreed. We watched the race to the end. Schumacher won again. And that was it. We went about the rest of our day unaware of the seriousness of the situation. The next day, a friend of mine phoned me to see if I was free to meet. During the call my friend asked “Did you hear about Senna?” “Yeah man, it was a bad accident but hopefully he’ll be alright” I replied. “He’s dead man” my friend replied. I dropped the receiver of the telephone. I couldn’t believe it. Apparently, it had been common knowledge and had been announced on the news the day before. Since I didn’t watch the news, I had no idea that he had passed away. My parents were waiting for a good moment to tell me and had not yet figured out how or when they were going to do it. I was in a little bit of shock and felt quite sad. Though at the time I didn’t really know much about Senna and hadn’t even seen him win a race live, I felt a big sense of loss. The news of his death was a big deal the world over. Millions of people lined the streets in Brazil to bid farewell to their hero: A man who was intensely patriotic and always proud to show that he was Brazilian despite all the problems that were present in his beloved country. The Brazilian government declared three days of national mourning. As the years went by, I read more and more about Senna. I also watched a number of documentaries about him including the excellent documentary that the BBC aired on new year’s day 1995. My friend Barry had recorded it and I got to see it the following summer when I returned from Egypt for a summer holiday. Later, Barry gave me this tape recording as a gift. Christopher, another friend of mine, gave me a book of a collection of photos of Senna through his career. I also bought other documentaries including A Star Named Ayrton Senna (released in 1998) and a documentary that had been filmed in 1991 titled Racing is in My Blood. I watched this tape over and over and over until it got almost worn out. Since it was filmed when he was still alive, it had the feel of being about who Senna is and not who Senna was which had something nice about it. This documentary was re-released more recently accompanying another documentary entitled The Right to Win on the 10th anniversary of Senna’s death. The re-release used a different narrator to the original (amongst other subtle differences) and didn’t have the same feel to it. I got my hands on anything about Senna that I could. I wanted to know more about the driver that we had lost that day. Some people ask questions like ‘What made Senna so special?’ or ‘Was he really the best?’ Both of these questions are difficult to answer. First, with regards to the question of whether or not he was the greatest driver ever: It’s impossible to say. He may well have been. But the thing is that it’s impossible to compare drivers of different eras with different times and different cars. Trying to compare Fangio with Clark with Senna is an exercise in futility. There are even drivers out there who never made it to F1 that may have been the greatest ever. It’s just impossible to say. One thing we can say about Senna was that he was certainly one of the greatest drivers who ever raced in Formula 1. There is absolutely no question of that. His ability has been described by other drivers and people in Formula 1 as being “on another level”. His incredible speed over one lap, astounding consistency over the course of a race, phenomenal car control (particularly in the wet), his high level of intelligence and never-give-up attitude made him one of the greatest. But what was it about Senna that has made him such a legend? A lot of people have suggested that it is to do with the fact that he died so young. Like Bruce Lee or James Dean. His legacy galvanised in a similar fashion. And, truth be told, there is likely some element of that. However, like Bruce Lee, there is more to Senna than the fact that he died so young. People have often asked me and I have even often asked myself what was it about Senna that I liked so much and why was he my favourite? I can’t speak for anyone else of course but I’d imagine that their reasons are likely similar to mine. Senna was a very charismatic person. When he talked, you just couldn’t help but listen. You could listen to him for hours and never get bored. Although he was a very private person, when he spoke in an interview you could tell that he was thinking deeply about what he would say and would speak very frankly and honestly. He was very often philosophical and introspective in a way that is not only uncommon amongst Formula 1 drivers but amongst people in general. He would think deeply about driving, about life and about the meaning of life and how everything he did contributed to that meaning. For Senna, there were bigger questions and he wasn’t afraid to face them. His skill behind the wheel of a racing car was something to behold. He would often accomplish feats that seemed impossible to other drivers… and these were Grand Prix drivers! One driver described Senna’s car like rain beating off the tarmac. The car seeming to be alive whilst still under his full control. Senna’s speed was undoubtedly one of his greatest talents. He would go into such a deep trance whilst driving that he would achieve things that used to scare even him. On one occasion during qualifying for the Monaco Grand Prix in 1988, Senna qualified almost a second and a half quicker than his teammate Prost in an equal car at a circuit that demands absolute pin point accuracy. Many athletes or people working in their element often describe the feeling of being “in the zone” but on this occasion, it seemed that Senna achieved a higher level than even he had experienced before. “I was well beyond my conscious understanding” Senna said afterwards. He said that it frightened him so much that he slowed down and returned to the pits. When it came to competition, he was committed. Extremely intense and focussed. And these are appealing and admirable characteristics which inspire. At the same time, there were elements of his character that were quite scary. When it came to competition, he was ruthless both in and out of the car. I have always said that competition brings out the best in a person’s ability and the worst in their character. He was one of the most aggressive drivers on track and was known for making a lot of unfair moves on other drivers. This manifested itself most in his rivalry with Alain Prost. In Estoril, Portugal in 1988, Senna squeezed Prost up against the pit wall whilst overtaking him. He also allegedly betrayed a pre-race agreement with Prost in the San Marino Grand Prix of 1989 (though the full details of this are not known). But without doubt, the worst act of driving Senna committed was in Suzuka, Japan in 1990. The events that led up to the incident were long and complex. In 1989, Senna had been disqualified for not driving his car through the chicane after a collision with Prost that was Prost’s fault. Video evidence shows that Prost intentionally drove into Senna as Senna tried to overtake him. This secured Prost the championship since Senna had to beat Prost in that race to keep the championship alive going into the final race. Senna felt this was so unjust that he almost quit the sport he loved. Fast forward to 1990. This time it was Prost that had to beat Senna. 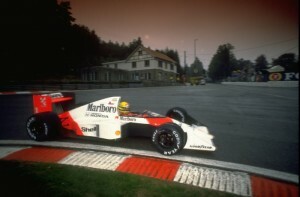 Senna believed that pole position should be on the cleaner side of the circuit since the driver who starts the race on pole should have the best chance of getting away quickly. He managed to get the officials to agree to put pole position on the clean side of the grid before qualifying started. However, once qualifying was over and Senna had obtained pole position ahead of Prost who had qualified second, Jean Marie Balestre (the then president of F1’s governing body) gave the order to keep pole position on the right and therefore dirty side of the grid. I believe that this enraged Senna so much that he was no longer thinking straight. At the start of the race, Prost made the best use of the cleaner side of the circuit and took the lead. Senna slipped into second and promptly crashed into Prost at the first corner. That Senna was able to intentionally cause an accident of that nature at over 270 km/h is definitely one of the blots on his career. Senna immediately regretted this action and, though his aggressive style continued, he became more intent on being fair. For me, Senna’s behaviour at that race is difficult to accept. I can understand why he did what he did but I can’t accept it. But nobody’s perfect and everyone should have the chance to redeem themselves. In this way, Senna perfectly embodies the ongoing battle that a sportsman must endure to fight between the desire to win and the need to do what’s right and be fair. These are the kind of demons that all race drivers must contend with inside the privacy of their helmet. Indeed, these are often the kind of struggles that we must all contend with in many different aspects of our lives. Despite the ruthlessness showed towards his rivals on the circuit, Senna was also prepared to risk his own life to help other drivers. Erik Comas crashed heavily during practice for the 1992 Belgian Grand Prix. The first driver at the scene was Senna. Senna quickly stopped his car, jumped out and ran to Comas’ car (almost getting struck down by another car in the process). When he reached the unconscious Comas, he quickly switched off the engine to prevent an explosion (it was later discovered that the fuel cell had been leaking) and held Comas’ head upright until the medical team arrived thereby preventing a potential permanent injury for Comas. 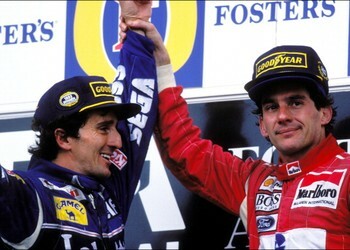 Towards the end of the 1993 season, Senna and Prost buried the hatchet at their final race together and Senna embraced Prost on the podium. On the morning of the San Marino Grand Prix, Senna performed a lap for the French channel Canal+ which Prost was commentating for at the time recording his pit-to-car radio. At the start of the lap, Senna said “A special hello to my dear… our dear friend Alain. We all miss you Alain”. 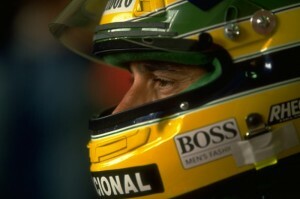 Senna also had a very strong faith in God and was known as one of the more spiritual drivers on the grid. I’ve always had a very strong interest in religion myself and this was another way in which I felt I could relate to Senna. But the truly greatest things about Senna for me and the things that I began to appreciate more as I got older were things like his humility, his kindness, his sensitive nature and his empathy for human beings in pain all over the world. Without wanting to make a show of it, Senna used to privately donate millions of his personal fortune to those in need and less fortunate than himself. Most of the money went to children in need of Brazil. Approximately two months before his death, Senna had expressed a desire to set up a foundation to be able to donate in a more organised way instead of the once-off donations he had been making up to that point in his life. He had a strong desire to do something in life worth more than just winning races and championships. Though he never got to see this through in his own lifetime, his elder sister Viviane continued his dream and the Ayrton Senna Institute (formerly the Ayrton Senna Foundation) is now an important NGO working in Brazil to give young children in particular a good opportunity in life. This is truly his greatest legacy. So on a day like today where I remember Ayrton Senna, I remember that we lost a person who was even greater out of the car than he was in it. Thinking of his death makes me sad but we still have the example of his life, though far from perfect, to be inspired by. The saddest I feel is for his family. 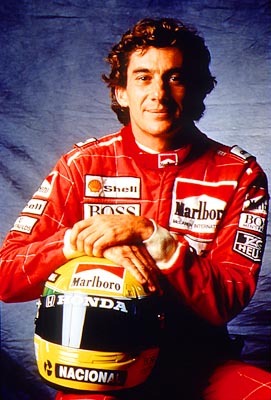 On the 1st of May 1994, the Senna fans of the world lost their favourite driver, Brazil lost their hero and the world of motor sport lost one of its greatest champions. But the Senna da Silva family lost a son, a brother and an uncle and the woman he was involved with and close to marrying lost her sweetheart. Thinking about this makes me appreciate the true tragedy. But nobody dies until it’s their time and I hope that Adriane and the Senna family appreciate this. I think I’d like to end with a quote from Senna himself. There are so many to choose from. Having watched so many interviews over and over, I know most of them by heart. But for me, choosing my favourite is easy.